(00000000030603DB)AuthenticationException. Remote certificate is not valid. <hostName, lyncfe01.customer.com> <port,443> System.Security.Authentication.AuthenticationException: The remote certificate is invalid according to the validation procedure. 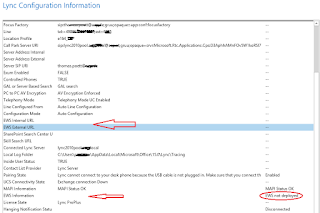 (000000000289B908)Unable to ensure we have the SecurityToken from issuer lyncfe01.customer.com, port 443. (000000000289B908)Did not find <thumbprint, 12DF9402A814C3C5F099D3E1974959F5037FA8B8> in dictionary. Exception: System.IdentityModel.Tokens.SecurityTokenException: Unable to resolve SecurityKeyIdentifier found in the SamlAssertion signature. The SamlAssertion signature can not be validated for the Issuer https://lyncfe01.customer.com/367030ae-f2fb-5c02-be25-fe905fabf83c. Exception: Microsoft.Rtc.Internal.WebServicesAuthFramework.WebTicketHttpHeaderException: Exception of type 'Microsoft.Rtc.Internal.WebServicesAuthFramework.WebTicketHttpHeaderException' was thrown. Set response for exception: Microsoft.Rtc.Internal.WebServicesAuthFramework.WebTicketHttpHeaderException: Exception of type 'Microsoft.Rtc.Internal.WebServicesAuthFramework.WebTicketHttpHeaderException' was thrown. $SIPString = $SIPString + $tempUrl+","
$SANString = $SANString + "SIP. "+$tempUrl +","
$SANString = $SANString + $tempUrl.replace("https://","") +","
Write-Host "Your certificate as requested is assigned (as fare you didn't saw any related issues)." Write-Host "Please order the Certificate and assign it manually to the Lync Services"